100% Cotton MADE IN ITALY Size : SMALL MEASUREMENTS: Measures 20 inches (20) approx from under arm to under arm at widest point. Measures 18 inches (18) approx across at narrowest point where fitted. Measures 29 inches (29) approx from bottom of collar to hem down centre of back. 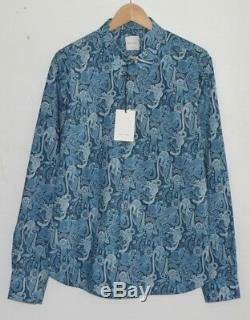 Monkey print shirt from PAUL SMITH. 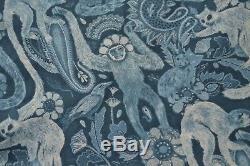 PAUL SMITH'Monkey' print cotton fabric. The PAUL SMITH'Monkey' design is in blue & white hues. Slim Fit - cut for a tailored fit, slimmer fit. 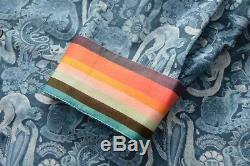 Inside of cuffs are lined with PAUL SMITH Artist Stripe fabric. 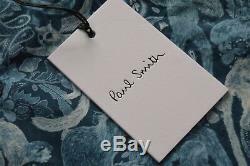 Embroidered PAUL SMITH label to inside neck. Card PAUL SMITH tag attached. This is a GENUINE shirt from PAUL SMITH. Perfect for ALL formal occasions with a suit or can be dressed down with chinos or jeans for a casual/smart casual look. 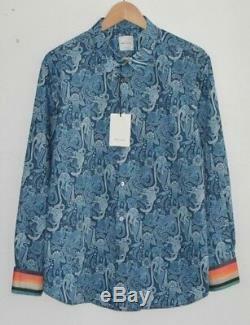 This is a stunning shirt - featuring the PAUL SMITH Monkey print which has become a'Modern Classic'. The blue & white colours make this a subtle shirt but when up close the details are fascinating. The PAUL SMITH'classic with a twist' way of thinking can be seen here thanks to the contrasting PAUL SMITH Artist Stripes inside the cuffs. Fold the cuffs back or roll up the sleeves to show off the cuffs - a bit of a bright colourful contrast! 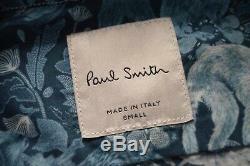 PAUL SMITH is the biggest designer in the UNITED KINGDOM & one of the most respected in the World. His use of colour & his CLASSIC WITH A TWIST can be seen throughout various collections. 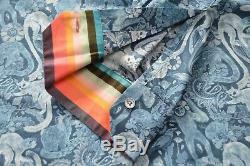 The item "PAUL SMITH Monkey rabbit birds flowers paisley blue white shirt stripe SMALL" is in sale since Friday, January 4, 2019. This item is in the category "Clothes, Shoes & Accessories\Men's Clothing\Shirts & Tops\Casual Shirts & Tops". The seller is "chrisd627" and is located in bedford, Bedfordshire. This item can be shipped to United Kingdom, Antigua and barbuda, Austria, Belgium, Bulgaria, Croatia, Cyprus, Czech republic, Denmark, Estonia, Finland, France, Germany, Greece, Hungary, Ireland, Italy, Latvia, Lithuania, Luxembourg, Malta, Netherlands, Poland, Portugal, Romania, Slovakia, Slovenia, Spain, Sweden, Australia, United States, Canada, Brazil, Japan, New Zealand, China, Israel, Hong Kong, Norway, Indonesia, Malaysia, Mexico, Singapore, South Korea, Switzerland, Taiwan, Thailand, Bangladesh, Belize, Bermuda, Bolivia, Barbados, Brunei darussalam, Cayman islands, Dominica, Ecuador, Egypt, Guernsey, Gibraltar, Guadeloupe, Grenada, French guiana, Iceland, Jersey, Jordan, Cambodia, Saint kitts and nevis, Saint lucia, Liechtenstein, Sri lanka, Macao, Monaco, Maldives, Montserrat, Martinique, Nicaragua, Oman, Pakistan, Peru, Paraguay, Reunion, Turks and caicos islands, Aruba, Chile.